*The shape of the great island in the kitchen. On the far left it has shelves for cookbooks and then you can see the drawers for storage and cubbies for baskets. It was awesome. This the the dining room ceiling. 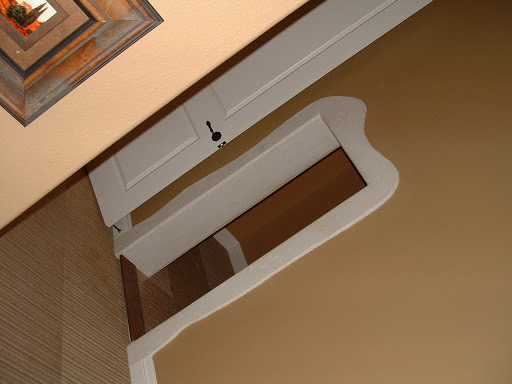 I like the way it’s shaped and the stenciling was one of my very favorite features. 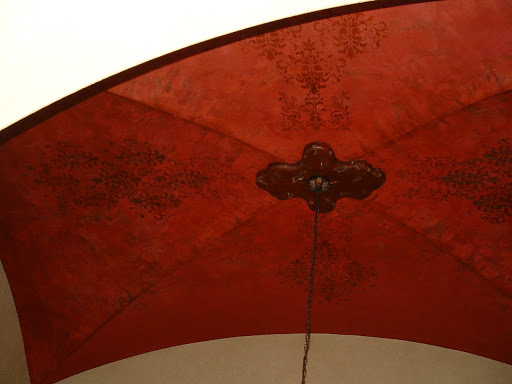 These designs were faintly painted on several different ceilings and walls throughout the house…I absolutely loved them. 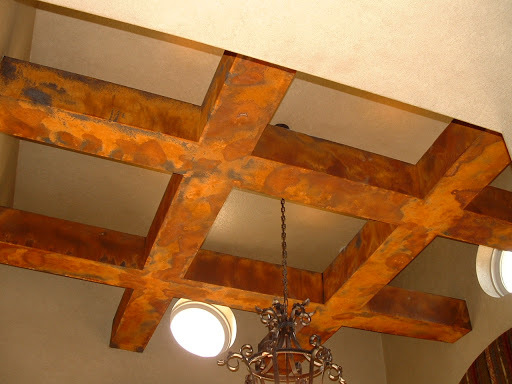 The beams in the master bedroom are faux painted to look like rusted steel. Not a feature I’d put in my own house but nicely done. 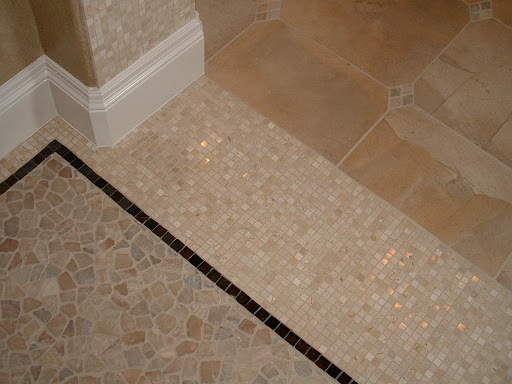 This is the tile in the transition area from the master bedroom to master bath. 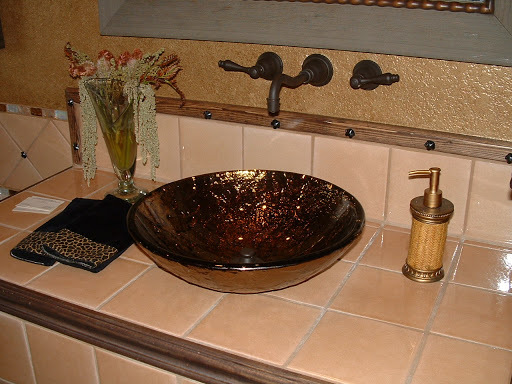 I like the way they used so many different types of tile so tastefully. 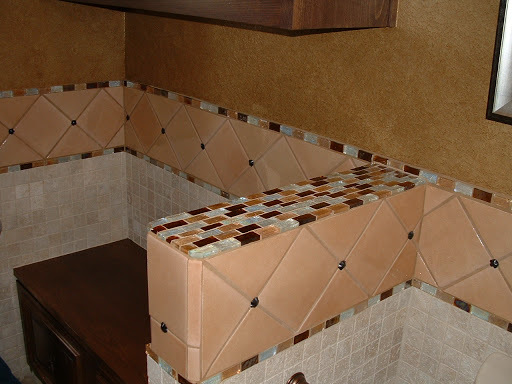 This is the hood over the range in the kitchen. If you look closely you can see the faint stencils again in the corners. At first I didn’t like the antique look of it. Uncle Ben described it as furniture from the Goodwill. 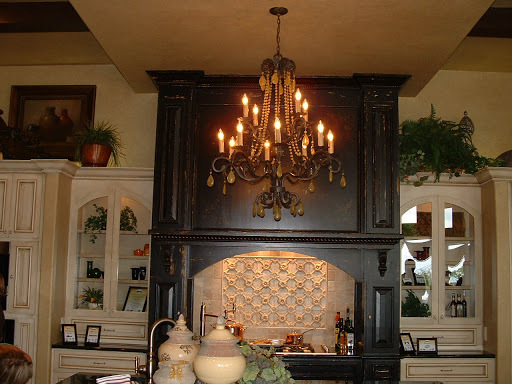 However, after looking at it for a week I came to appreciate the contrast between the dark antiqued wood and the cream glazed cabinets. I really like the finished kitchen. The wonderful utility room. The wrapping paper station is there on the left, along with the personal valet. The personal valet is your very own dry cleaner. I guess you can get them for about $350 which sounded like a deal to me. You can see the open shelving unit under the window…it moves so you can roll it around, pull it out and stick a chair behind it for a desk or use it as a second workspace at the computer nook which is just around the corner. Ingenious :). This is the view from the elevator…that’s right, the elevator. Just in case your elderly parents need a place to stay. It had an old fashioned accordion gate and the doors to the shaft were automated to be locked unless the elevator was waiting behind the door. This picture was the best I could do, sorry it’s diagonal. 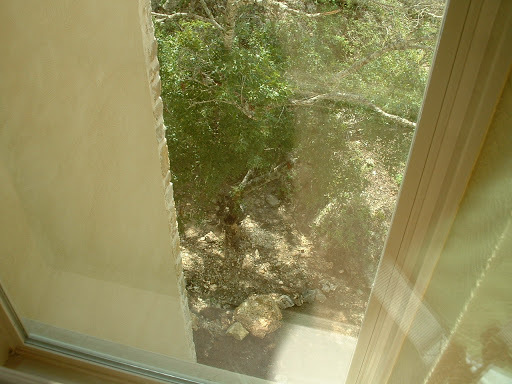 That little doorway is off of one of the children’s bedrooms. It opens into a little cave-like play area set up with little rocking chairs, video games and a storage ottoman. It was a popular feature. 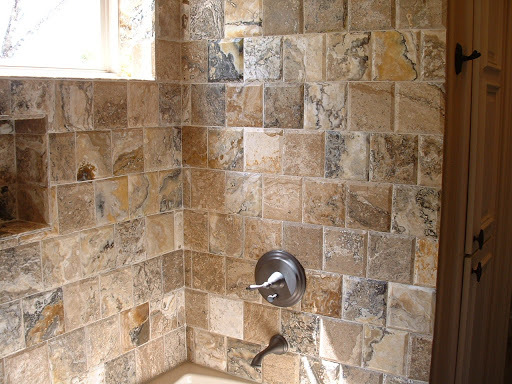 This is the bath for the second bedroom upstairs. Ritchie really likes the tile. I included this picture for the golfers. This is the golfcart garage (this house is located on the golf course in this 8800 acre subdivision out in the country). 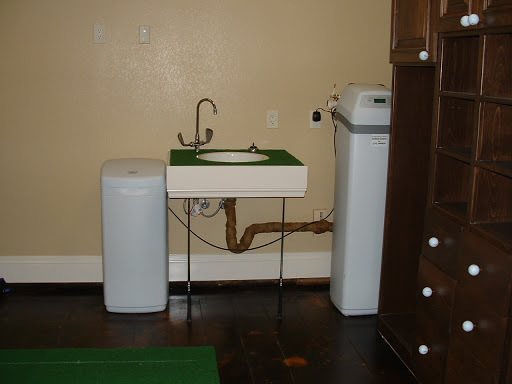 Notice all the golf stuff in the picture….golf ball drawer pulls, putters for the sink legs, astroturf as the countertop and putter heads for the hot/cold fixtures. Ritchie helped brainstorm this one. I thought it was pretty clever. And finally, the powder bathroom. This sink is so awesome. Sadly, it costs $1,000 so I will never own one but I can admire it in this picture. It’s hard to appreciate the tile from these but they’re all colored glass and the total effect is great. The media room wasn’t represented in these pictures or in the slideshow. It had a mini-kitchen, huge screen tv, leather couch and round poker table. I really liked the sliding windows that allowed you to pass through food/games from the media room to the main level veranda. 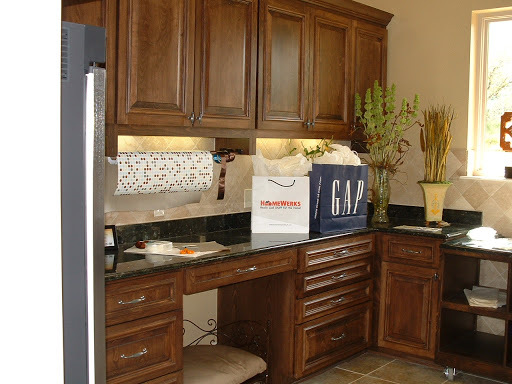 Hope you’ve enjoyed this little view of Stadler Custom Homes’ 6 Augusta. Have a terrific day! How nice of you to put my house on display! Haha yeah right. But im pretty sure if you could afford a 2.9 mil dollar home, you can afford a cleaning service so you yourself wouldnt have to dust those ceilings. Im amazed. Im sure the pics dont even do it justice! I wish i could see it! Much better tour than the one they gave on the San Antonio morning show clip that I saw. Lots of unique ideas as always! I was going to say tht same thing as Cathy. 🙂 That home is amazing! 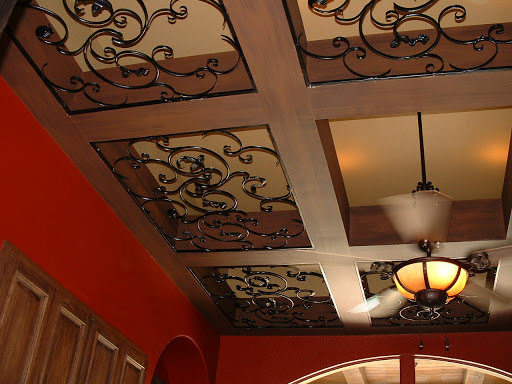 I have been looking for an iron panel I could put up above my front door, but I never considered using them as the ceiling! That sink is awesome and I love the little kids room. I’m sure it’s way cute on the inside. I’d love to see it in person!